What Is that Funky Finish? 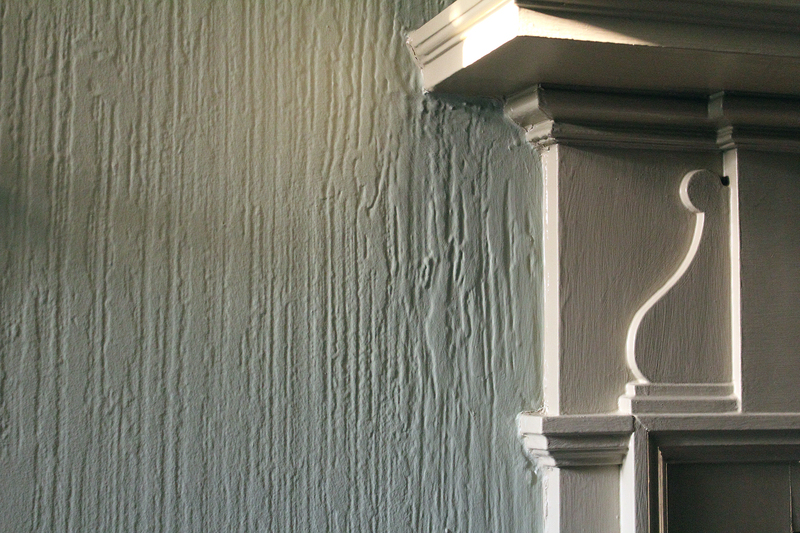 The living and dining rooms’ wall texture is original to my house (built in 1938). My next door neighbor and other older homes in my neighborhood have the same finish. When I first moved into the house I thought it looked depressing and grandma-ish. But now, I’m so glad that I kept it. What was the technique called? Did it even have a name? Even my painting contractors found it unusual and had a difficult time emulating it while repairing patches. When the 1960’s kitchen was torn out, we discovered that the original breakfast room originally had this same texture. The rest of the house (the remaining original rooms) has what looks to be the knock down texture which carries the orange peel effect one step further by semi flattening the raised bumps. The orange peel technique had also been used originally for all the ceilings in the house and is the texture we chose for all of the reconstruction’s painted surfaces.